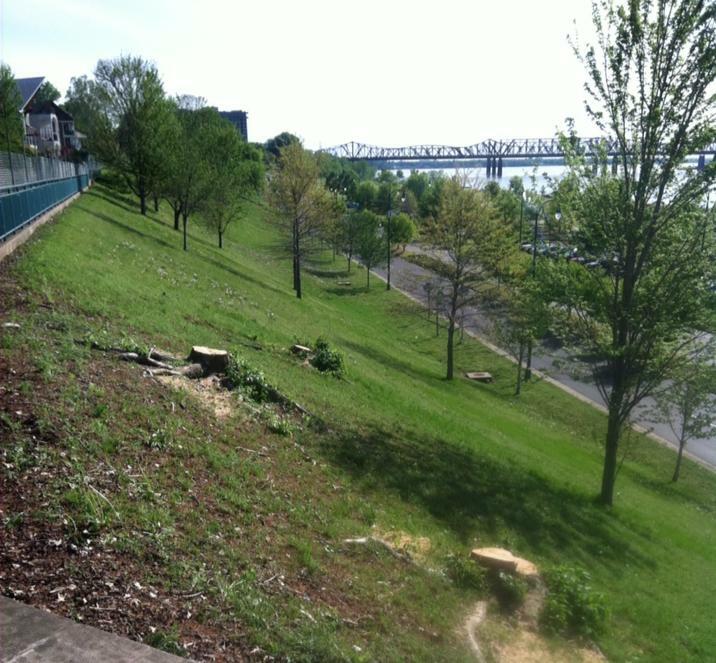 Responding to complaints by blufftop residents that trees were blocking their view, the City and Riverfront Development Corporation sent trucks and crews to the Bluff on Saturday morning (4/20) to cut down 25 trees. Several people were shocked to see the trees gone, apparently without any public notice or review. "Officials say the planned removal of 25 trees from the bluff section of the Riverwalk is not for the benefit of residents in high-dollar homes overlooking the Mississippi River, although a study associated with the project was triggered in part by residential complaints about obstructed views," acording to an article in the Commercial Appeal. That study was prepared January 2013 by JPA, Inc. and also included other suggestions for maintenance of the Bluffwalk area. Strangely, four days earlier, the City Council had approved members to a Memphis Tree Board to advise the City on "the stewardship of public trees, promote public awareness programs of the positive contributions of trees in the community,...." The new board is composed of Mark Follis, PHD, ISA Certified Arborist; Westly Hopper, ISA Cerfitied Arborist; Eldra White, Memphis City Beautiful; Christopher O.Brian, Certified Arborist; Eric Bridges, SAT Certified Arborist; and Andree Glen, BOMA Certified RPA, FMA.